HAGERSTOWN, Md. & YONKERS, N.Y.–(BUSINESS WIRE)–Jamison RFID (a division of Jamison Door Company) the leading manufacturer and integrator of rugged, purpose-built RFID portals and communications enclosures, and CYBRA Corporation, the developer of award- winning MarkMagic™ Bar Code Labels, RFID Tags, Electronic Forms, and Report Writing Software and EdgeMagic® Integrated RFID Control Software, announced today the introduction of their new CYBRA-Hawk RFID-based EAS (Electronic Article Surveillance) loss prevention and inventory management solution custom designed for the special requirements of retailers. The companies are making the announcement at the Retail Value Chain Federation (RVCF) Fall Conference in Scottsdale, AZ. Due to the high cost of retail real estate, retailers try to put as much merchandise on display as possible. Current RFID offerings designed for warehouses are not practical in a retail environment because a distribution center dock door is a much broader read zone than a customer entrance to a mall store. Warehouse RFID solutions will pick up too many false reads if placed in a store. The CYBRA-Hawk Portal solves that problem by providing a very focused read zone in an easy to install, easy on the eyes enclosure. CYBRA-Hawk combines CYBRA’s industry leading EdgeMagic RFID Control software platform with Jamison RFID’s Hawk RFID all-in-one read station to deliver an end-to-end retail solution that allows companies to track goods from the manufacturer or distribution center, to the point of sale (POS) using a single UHF RFID tag. Using the CYBRA-Hawk solution, retailers can not only prevent theft and shrink with real-time, RFID-based electronic article surveillance (EAS) technology, but also track and manage inventory at the item level across the supply chain. With the CYBRA-Hawk solution, items are tagged at the point of manufacture and tracked across the supply chain. At the retail store level, the solution can be used to receive items, to automate inventory counts on the shelf, to prevent theft, and finally for POS check-out. The combined EAS/RFID tag eliminates manual counts and bar code scanning, while still providing high levels of security and anti-theft functionality. For small and mid-sized retailers, CYBRA-Hawk provides a cost-effective alternative to traditional EAS solutions, while also providing inventory management features that can accelerate their return on investment (ROI). The CYBRA-Hawk solution is available now. 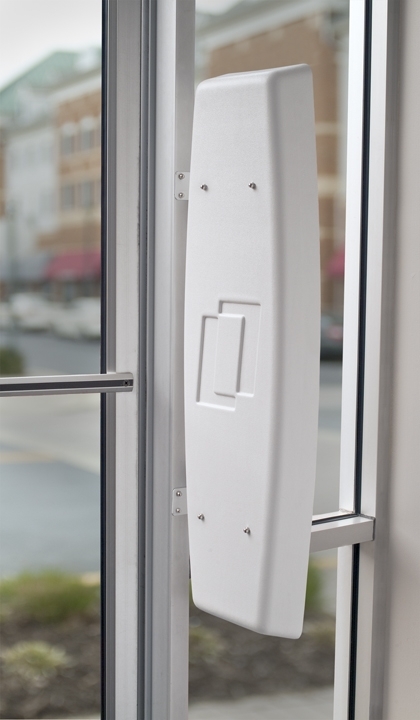 Since 1906, Jamison Door Company has pioneered the industrial door industry with innovative designs, unsurpassed product quality, and outstanding customer service. Jamison’s RFID Industrial Portals™ Division produces the world’s largest variety of Radio Frequency Identification – RFID portals, housing structures, mounting components, and custom designed enclosures that help track products using RFID during the manufacturing process and throughout the entire supply chain. Jamison services over 6000 warehouse, retail, and supply chain customers from three North American manufacturing plants; in Maryland, Montana, and Mexico City. Jamison offers fully-staffed engineering, customer service, and shipping departments. For more information, go to www.JamisonRFID.com. CYBRA Corporation is a leader in RFID and bar code technology serving customers in a wide range of industries. Thousands of organizations worldwide rely on CYBRA’s innovative solutions such as EdgeMagic® and MarkMagicTM, daily as the Auto-ID engine underlying their critical applications for retail compliance, shipping, inventory, warehouse management, in-plant printing and print and apply automation. A GS1 Solution Provider and an IBM Business Partner since 1989, CYBRA develops solutions for leading printer, reader, and RFID tag manufacturers. CYBRA is represented by a network of value added resellers throughout the United States and sales and support offices overseas. CYBRA software solutions run on all major computing platforms including IBM Power Systems (System i, iSeries, AS/400, AIX) as well as Linux, Unix, and Microsoft Windows. For more information, go to www.cybra.com or write to info@cybra.com.